You are buying Enfamil Gentlease Toddler Transitions Formula Powder 21.5oz Each, Model #4908711. ADW Diabetes offers a complete line of Enfamil baby formula products both in liquid and powder form. We offer these items in both single and discounted bulk quantities for your convenience.Trust ADW Diabetes for your Enfamil baby formula needs as we offer excellent pricing and superior service. 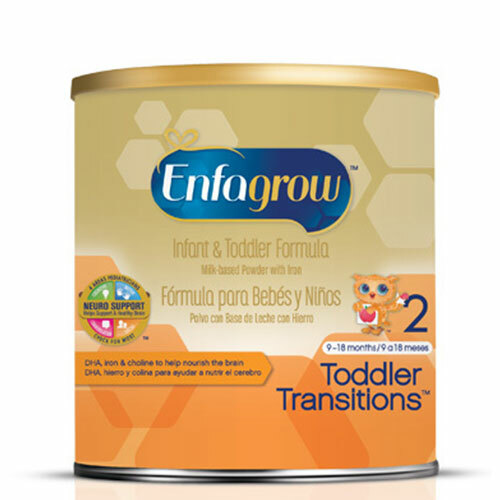 The Enfamil Gentlease Toddler Transitions Formula Powder 21.5oz is Part of Enfamil Staged Nutrition, along with Enfamil Newborn, Enfamil Infant and Enfagrow Toddler Transitions. Perfect for children transitioning from Enfamil Gentlease, Enfagrow Gentlease is designed for toddlers 9 months and up experiencing fussiness and gas. A special blend of easy-to-digest proteins and has 50% the lactose of a routine milk-based infant and toddler formula. DHA to help support brain and eye development. Iron to help support mental development and antioxidants to help support your toddler's developing immune system. Corn Syrup Solids, Partially Hydrolyzed Nonfat Milk, and Whey Protein Concentrate Solids (Soy), Vegetable Oil (Palm Olein, Coconut, Soy, and High Oleic Sunflower Oils), Calcium Phosphate and Less Than 2%: Mortierella Alphina Oil(ARA), Crypthecodinium Cohnii Oil(DHA), Vitamin A Palmitate, Vitamin D3, Vitamin E Acetate, Vitamin K1, Thiamin Hydrochloirde, Riboflavin, Vitamin B6 Hydrochloride, Vitamin B12, Niacinamide, Folic Acid, Calcium Pantothenate, Biotin, Ascorbic Acid, Choline Chloride, Inositol, Calcium Chloride, Magnesium Phosphate, Ferrous Sulfate, Zinc Sulfate, Manganese Sulfate, Cupric Sulfate, Potassium Chloride, POtassium Iodide, Sodium Selenite, Sodium Citrate, Taurine, L-Carnitine.